Another Beautiful Day in Paradise. Everyone that we know of found our meeting place, parking lot # 8. Bill B. didn't show for the group picture but we saw him skating the trail. Our planned route was up to the Suncoast Parkway and back. However Willi and Michael E. also did a couple of miles on the Suncoast Parkway. It was fairly shady on the way out but as the sun got overhead the shade disappeared. It was good to see Herb, Willi and Mike M again. Welcome back. 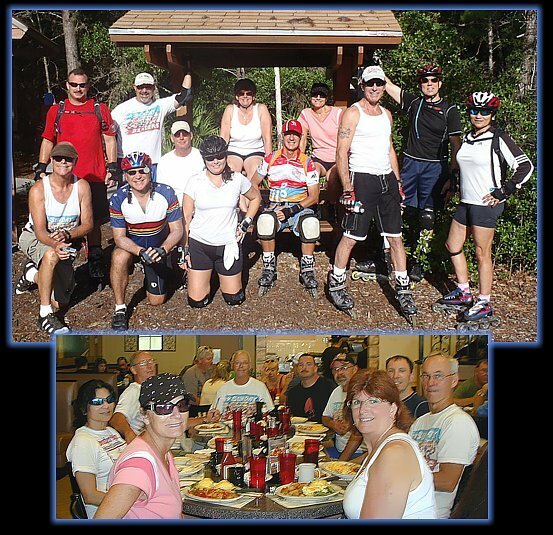 Roy indicated the skaters going up to the Suncoast Parkway and back did 13.5 miles. Willi and Michael probably did around 15 or 16 miles. We had 5 bicyclists today. Janet L. became a Sponsor. Check out her picture on the Sponsors Page. Thanks for the support Janet L.
We Brunched at Christos as planned. We got in right away and all sat a big table. Service was pretty good. Many of us got the specials of the day but they didn't turn out to be that great. However we had a very nice social exchange and discussed upcoming events. Rob rated his brunch an 8.5 Mine and others were a little better. We'll give them an 8.5 +.